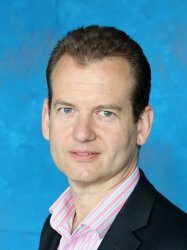 Professor Anthony Gordon is the Chair in Anaesthesia and Critical Care at Imperial College and is a Consultant in Intensive Care Medicine based at St Mary's Hospital. He received his medical degree from St Bartholomew’s Medical School in 1993 and then undertook his postgraduate medical training across the North Thames regions with an additional year spent at The Royal North Shore Hospital in Sydney, Australia. He was awarded the Fellowship of the Royal College of Anaesthetists in 1999 and returned to Barts to obtain his research doctorate examining genetic susceptibility in sepsis. Having obtained a dual CCST in Anaesthesia and Intensive Care Medicine he was awarded the Intensive Care Society visiting fellowship in 2005 and spent two years in Vancouver at St Paul’s Hospital, University of British Columbia as a post-doctorate fellow. During this time he also worked as the Director of Medical Development of a university spin-out company developing pharmacogenetic tests for use in the ICU. Prof Gordon returned to the Imperial AHSC in November 2007, and was a recipient of a Clinician Scientist Fellowship award from the National Institute for Health Research (NIHR) and is currently an NIHR Research Professor. He is Chief investigator on two multi-centre trials examining alternatives to catecholamines in septic shock. Early vasopressin use in septic shock and its interaction with corticosteroids (VANISH trial) and also levosimendan for the prevention of organ failure (LeoPARDS trial). He leads the "Emergency and Critical Care" therapeutic group within the Imperial Clinical Trials Unit. He is a Director of Research for the Intensive Care Foundation. He is Chair of the Experimental Medicine subgroup of the NIHR Critical Care Specialty Group helping to deliver nationwide clinical studies. He is leading a multidisciplinary group investigating the use of metabonomic analysis to develop novel sepsis diagnostics in peri-operative and critical care. He is a member of the management committee of the UK Critical Care Genomics group. This multi-disciplinary group brings together ICU clinicians, infectious diseases experts, geneticists and bio-statisticians to study the effects of genetic polymorphisms on the progression and outcome of severe sepsis. The GAinS study (Genomics Advances in Sepsis) has recruited more than 3000 patients with sepsis admitted to the ICU.